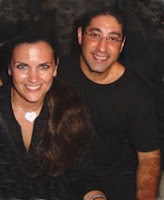 What connections does DLE Lawyers have with Miami Beach Family and Sports Chiropractic Centre? Personal Injury Lawyers and chiropractors can sometimes go hand in hand. When someone gets hurt from an accident, the first thing they should do is get help from a medical or chiropractic physician. Once they have been treated, one of the next things they should think about is contacting a personal injury lawyer. Why should you use Miami Beach Family and Sports Chiropractic Centre? Miami Beach Family and Sports Chiropractic Center will work to help you feel better after your accident and help to relieve the pain where it hurts you the most using physiotherapy, chiropractic and rehabilitation techniques. Dr. Narson uses his experience and education with athletes and sports injuries to treat all patients, not just athletes. 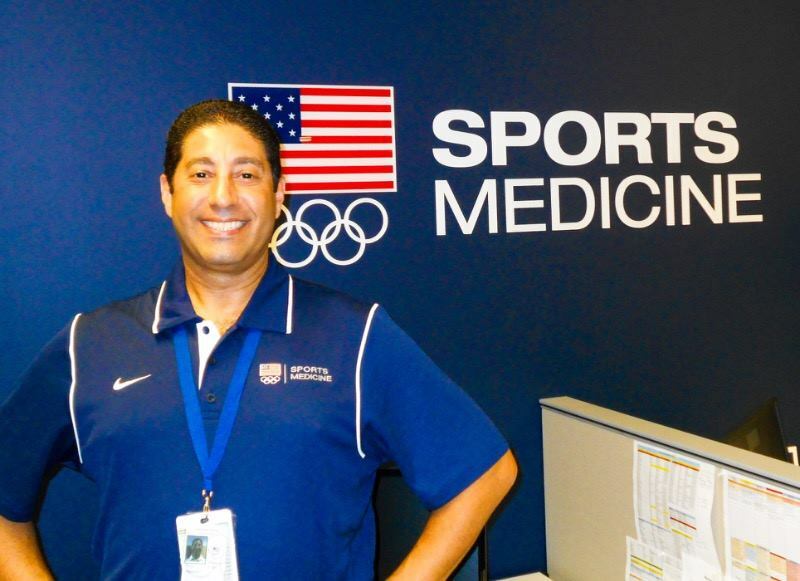 Moreover, Dr. Narson feels everyone deserves the knowledge of a sports medicine physician, because everyone, in his or her own way is an athlete as some level. Do DLE Personal Injury Lawyers recommend Miami Beach Family and Sports Chiropractic Centre? Absolutely! Miami Beach Family and Sports Chiropractic Centre provides a quality service that does more than your average chiropractor in Miami. Unlike conventional medicine, which focuses on attempting to treat disease once it occurs, Miami Beach Family & Sports Chiropractic Center emphasizes improving your health in an effort to reduce the risk of pain and illness in the first place. Most people would rather be healthy and avoid illness, if they could. Many people are scared to talk to a lawyer because they think it will be expensive. Personal Injury lawyers are different because they chart a contingency fee. Contingency fees mean that the lawyer will only get paid based on what you win from the case. Most Personal Lawyers will charge anywhere between 30%-45% of what you made from the lawsuit. This is great because if you lose the case you wont owe the lawyer any money. In addition, the personal injury lawyer you choose is incentivized to get you the highest amount because it means he or she will make more money with you. 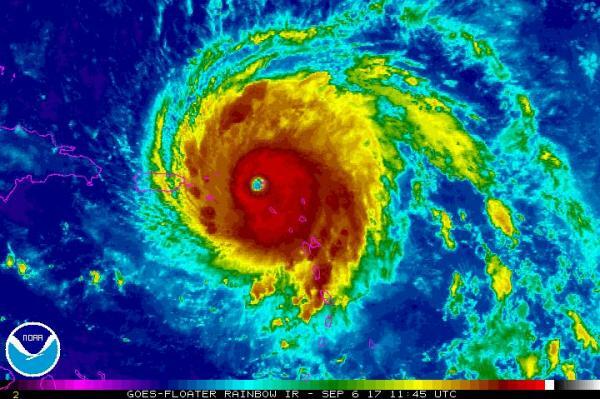 If you believe you have a personal injury case and the accident happened in Florida, make sure to call DLE Lawyers. You can find their contact info here. If you where injured or hurt from the accident, make sure to use Miami Beach Family and Sports Chiropractic Centre to heal faster. 2151 S Le Jeune Rd, Suite 305, Miami FL. I first encountered Shephard's pie during lunch at Coral Springs Middle School. Surprisingly, I loved it. That was probably a first for a school lunch anywhere. Since being an adult and a doctor, eating healthy is a part of my life and based on much research, paleo is how I eat. I've seen and tried several recipes for paleo Shephard's pie and have tweaked them to the point I call this one my own. I make it with either grass-fed ground beef or free range ground turkey (not ground turkey breast because it comes out too dry). Shephard's pie has two layers, the "meat mixture" and the topping. Instead of mashed potatoes, this recipe uses a cauliflower mash. The recipe uses carrots, onions, celery and cauliflower, so there is quite a bit of 'veg' in there. Also, you can use the cauliflower mash as a side dish for steak, chicken, fish or use it by itself as a snack. try it as you make it, you'll see. If you like a hearty, savory meal, this is it. I make a tray of it and use it for lunch and dinner for about 3-4 days. I hope you enjoy it as much as I do. Place a couple inches of water in a large pot. Once the water is boiling, place steamer insert and then cauliflower florets into the pot and cover. Steam for 15-20 minutes, until fork tender. Drain and place in large mixing bowl. Add the ghee, nutritional yeast, garlic powder, onion powder, salt, and pepper to the cauliflower. Using an immersion blender (aka: stick blender) to combine the ingredients until smooth. Taste test for flavor, make any adjustments then set aside. Meanwhile, heat the coconut oil & ghee in a large skillet over medium heat. Add the onion, celery, and carrots and sauté for 5 minutes until carrots and celery get soft and onions become clear and just start to brown. Add the salt, pepper, ground clove, cinnamon and smoked paprika to the ground beef, combine well until the spices are well incorporated into the ground beef. Flatten into a large patty and place on top of the carrot/onion/celery mixture and press the ground beef into the pan. Cook until it browns (once one side is brown, cut it into 4 piece, flip each piece so the other side can brown. Once the second side browns, chop into small pieces with a chopper. Cook for another 3-4 minutes and mix as you go. Stir the tomato paste and chicken broth into the meat mixture. Season to taste with salt and pepper. Simmer for 3-4 minutes, stirring occasionally. Sprinkle coconut flour on top of meat mixture, then, mix it into the meat mixture to thicken the sauce. Let simmer another 2-3 minutes. Distribute the meat mixture evenly in a rectangular glass pan to about ½ the height of the pan wall. Distribute cauliflower mash evenly over the meat mixture until the meat mixture is completely covered. Sprinkle (non-smoked) paprika lightly over the top. Place in oven on 325 for 15 minutes. Then broil until top later starts to brown. Let me just say.... Wow, this was good! Top 20 Reasons Why You Need A Sports Chiropractor! How Do You Act When The World Is Watching? I knew that if If I screwed up or goofed off or played a prank, it could have a negative impact on other sports chiropractors everywhere. If I wasn’t thorough in my consults and exam, if I wasn’t effective in my treatment, if I was disrespectful in any manor it could have a negative impact on my profession. While at the Olympic Training Center I considered myself an ambassador for my profession. What I did there could reflect positively or negatively on my profession. As such I have to say to swimmers Ryan Lochte, Gunnar Bentz, Jack Conger and Jimmy Feigen of Team USA (and to all athletes everywhere representing your family, town, county, school, state or country) - you are all ambassadors. We watch you with high hopes and hold you in high regard. We cheer for you when you compete, we ache with you when you lose or get hurt and we feel such pride when you win. You are an extension of us. You carry the spirit of our country with you wherever you go and what you do on the world stage reflects on the USA and each and everyone one of us here at home. Recently I was asked to be part of a panel discussion on the topic of concussion in sports and of course I did it. It was Co-Hosted by exercise physiologist and health coach Lisa Dwoskin & New York Giants Hall of Famer Lawrence Taylor. I was happy to share the spotlight with my esteemed colleague Dr. Steve Perman of West Boca Raton, FL. Concussion in sports is a deep topic. Think of the mad hatter going down the rabbit hole. You don't know how deep it will go or where it will lead you. Just expect the unexpected. Enjoy the video and post your thoughts and comments below. The take home message from all this is (1) treat all concussion, even mild ones-seriously. (2) parents with children on a sports team where concussions and other sports injuries are probable, pool some money together and hire an athletic trainer or a certified sports chiropractor to evaluate and manage any injuries. (3) When it comes to concussion, all those bumps on the head add up. Addressing them early by a competent functional neurologist can make all the difference. Dr. Narson is a 2-term past president of the Florida Chiropractic Association’s Council on Sports Injuries, Physical Fitness & Rehabilitation and was honored as the recipient of the coveted Chiropractic Sports Physician of the Year Award in 1999-2000. He is an active triathlete, USA Triathlon Certified Coach and Ironman Miami 70.3 finisher. 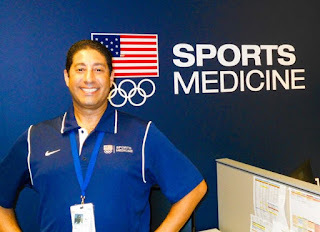 He practices in Miami Beach, Florida at the Miami Beach Family & Sports Chiropractic Center; A Facility for Natural Sports Medicine. It’s not that Schmorl’s nodes are mythical, they actually do occur. The problem is doctors and scientists like to give conditions they discover cute (and sometimes not so cute) names that are really not very descriptive of the physiology of the actual condition. Such is the case with Schmorl’s nodes. First described by Schmorl in 1927, a Schmorl’s node has classically been known to be due to any process which weakens the cartilaginous endplate or the subchondral cancellous bone. Schmorl’s nodes have been most commonly associated with Scheurman’s disease, Paget’s disease, degenerative joint disease, sickle cell anemia and malignant tumors. Essentially they occur because some physicologic process has gone awry, weakened the bony end-plate of the vertebral body and as the bone weakens, pressure from the disc pushes and deforms upward into the vertebral body. When physicians see Schmorl’s nodes on x-ray, CT-scan or MRI it is typically brushed off as an incidental finding-regardless if the area is symptomatic or not. Although radiology text books always mention trauma is a possible cause, it’s always at the very bottom of the list potential diagnosis and usually never given a second thought. I think this needs to change. 2 studies published in Spine V. Fahey et. al.) 1998 and the American Journal of Neuroradiology (Wagner, et. al. 2000) seem to bring the Schmorl’s node phenomenon to the top of the list when there is spinal pain caused by a trauma in an area where a Schmorl’s node is present. These papers show that not only can trauma cause a Schmorl’s node but most (57%) of the Schmorl’s nodes in 2000 AJNR study were traced to episodes of “significant, sudden-onset, localized, non-radiating back pain and tenderness for which the MRI images showed Schmorl’s nodes surrounded by vertebral body marrow edema”. Now that we know Schmorl’s nodes are occurring from trauma more often than originally thought, what exactly is a traumatically caused Schmorl’s node? That’s a very simple answer. 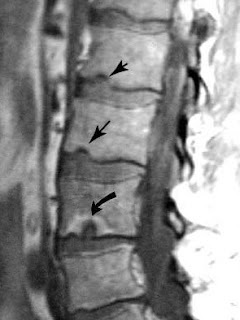 With a strong annulus and enough pressure placed on the intervertebral disc seen in car accidents, falls and other trauma; the force takes the path of least resistance fracturing and herniating up through the inferior and/or superior end plate of the vertebra - fracturing its way into the spongy bone. Bottom line, if you find yourself having pain after a trauma and your x-rays, CT scan or MRI shows a Schmorl's node(s) in the area of your injury, then you can bet that the Schmorl's node was caused by the trauma. Just rule out the other Schmorl's node associated conditions first. Now you just have to find a physician open minded enough to read the research and work with you to resolve your symptoms. 4) Wagner AL, Murtagh FR, Arrington JA, Stallworth D, American Journal of Neuroradiology 2000 Feb;21(2):276-81; Relationship of Schmorl's nodes to vertebral body endplate fractures and acute endplate disk extrusions.